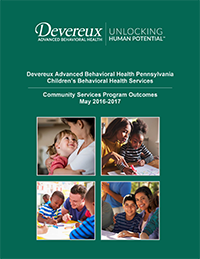 Click on the image above for the latest Devereux Pennsylvania CBHS Community Services Program Outcomes report. Admissions, inquiries and referrals are centralized through the CBHS office. All referrals are received, evaluated and considered for the best CBHS program(s) to ensure progress and success. Notice: The Joint Commission uses information from a variety of sources to improve the quality and safety of the more than 19,000 health care organizations it accredits and certifies. One of the sources is comments from individuals who have been served directly, their families, government agencies and the public, as well as from an organization’s own staff and the media. If you have a comment about Devereux Pennsylvania Children’s Behavioral Health Services (CBHS), you are encouraged to report that information to either Patricia Hillis-Clark, Executive Director of CBHS, or The Joint Commission’s Office of Quality Monitoring. The Commission suggests bringing any issue to the attention of CBHS leadership for direct resolution of your concern.